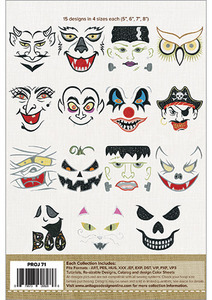 These Spooky Faces are a fun addition to any hand towel! The towel makes the base color for these faces while appliqué fabrics add color, dimension and design elements. Embroidering on a towel is very easy once you know the basic steps. These faces also look great on t-shirts, sweat shirts and trick or treat bags!